The wildlife of Antarctica is uniquely adapted to withstand the harsh conditions of this region. The seven penguin species found in the Antarctic are the Adelie, Chinstrap, Emperor (of "March of the Penguins" fame), Gentoo, King, Macaroni and Rockhopper. The six seal species are the Antarctic fur seal, Crabeater, Leopard, Ross, Southern Elephant and Weddell. Six species of whales belonging to the southern baleen group make their home in Antarctica for at least part of the year: Blue, Fin, Humpback, Minke, Sei, and Southern Right. Six different species of toothed whales are commonly seen in Antarctic waters: Sperm, Orca, Southern Bottlenose, Southern Four-tooth and Hourglass, and Southern Right Whale dolphins. There are more than 40 species of flying seabirds and landbirds, with Skuas, Petrels, Gulls, and Cormorants among the more common. Banding and recovery studies show that some Antarctic birds travel throughout the world. Penguins are designed for life in the sea. Some species spend as much as 75% of their lives in the water, though they lay their eggs and raise their chicks on land. A streamlined body, paddle-like feet, insulating blubber, and feathers for waterproofing all add to their efficiency and comfort underwater. Heavy, solid bones act like a diver's weight belt, allowing them to stay submerged. Their wings, shaped like flippers, help them "fly" underwater at speeds of up to 15 mph. They also have a remarkable deep-diving ability. In addition to blubber for insulation, penguins have stiff, tightly packed feathers (up to 70 per sq. in.) which overlap to provide waterproofing, coated with oil from a gland near the tail to increase impermeability. Their distinctive black and white shading makes them nearly invisible to predators from above and below. Like most birds, penguins have little or no sense of smell (a boon for those in a crowded penguin rookery!) Like other birds, their sense of taste is also limited. Scientists suspect they may be nearsighted on land. Their vision appears to be better when they're underwater. 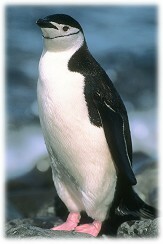 Penguins are considered to be the most social of birds. Rookeries may contain thousands of individuals. (As many as 24 million penguins visit the Antarctic continent!) Even at sea, they tend to swim and feed in groups. Most species of penguins build nests, but the nests may consist only of a pile of rocks or scrapings or hollows in the dirt. Emperor penguins build no nests; they hold the egg on top of their feet under a loose fold of skin called the brood patch. Students will investigate animal adaptations to a cold environment, specifically how they keep warm. Students will incorporate key findings by designing an organism well-adapted to this environment. Flying birds need large wingspans to hold themselves up in the air, but small wings work best for birds swimming through water. Demonstrate this with two pieces of flexible card. Try to push one, flat, through a pan of water. It's hard. Fold another piece five or six times and try pushing that through the water. The smaller, stiffer card, like a penguin's wing, works better. Most birds have hollow bones to make their bodies light enough to become air-borne. But the penguins' heavy, solid bones help them float lower in the water. With the help of two student volunteers, demonstrate the difference between hollow bones and solid bones using two toilet paper rolls, one empty the other stuffed with tissue paper. Float an empty can in a bucket of water open end up. It floats high in the water like flying aquatic birds (ducks, for example). Add sand to another can until it sinks slightly. Now push down on both cans. The sand-filled container is easier to push down into the water. In this way, it's easier for penguins to dive into water. Each work team of 2-4 students will need 4 bags and 2-3 cups of solid shortening. Have students take turns covering one hand with a plastic storage bag. Put a generous amount of solid shortening into another bag. Have the student put the plastic-covered hand into the bag with the shortening. Knead the shortening to make sure the hand is completely surrounded by shortening. Wrap masking tape around the portion of the bag covering your wrist to seal the bag. (optional). Cover the other hand with 2 bags without shortening. This is the "Control." Remove the bags from the students' hands and seal the inner bags so water won't get in. Drop weights into the outer bag of each double "glove" and put the bags gently back into the bucket of water. How much weight can each bag hold before it sinks to the bottom of the bucket? Penguin parents work in teams incubating their eggs. One parent keeps the egg warm, while the other goes off to feed on krill and fish. Gentoo parents trade off every day, while Adelies switch every two weeks. How do the Adelies survive while sitting on the nest for this length of time? What are some other Penguin strategies for nesting and incubating? Create a New "Antarctic Adaptable"
As a class, make a Venn diagram to show the ways that penguins are different from and similar to other birds. Next, in smaller groups, make Venn diagrams showing how penguins are both different from and similar to seals, whales, fish, and other birds. Using ideas from the discussion about penguin adaptations and the Venn diagrams, have groups of students design an original marine animal that is also well-adapted for the cold. Make a picture of the animal or model it from playdough or clay and place it in a shoe box diorama. Label unique features which help it adapt to the cold. Have students explain the rationale behind the design of their animals and habitats. Does it reflect earlier discussions. Both of the above activities are excerpted from P2K's LIVE FROM ANTARCTICA 2 Teacher's Guide.